In-Sight® Micro 8000 series smart cameras, a new family of ultra-compact, standalone vision systems deliver industry-leading vision tool performance at PC speeds, all in the form factor of a traditional “dumb” GigE Vision® camera. Measuring just 31mm x 31mm x 64mm, all In-Sight 8000 series models feature power over Ethernet (POE), and provide the best standalone vision system option for integrating into small spaces. As the world’s smallest, full line, standalone vision system, the In-Sight 8000 series offers range of vision systems available in VGA, 1MP, 2MP and 5MP resolutions. Supporting Gigabyte Ethernet for high speed communications, these vision systems offer very fast acquisition and two performance levels to meet a diverse array of machine vision demands. In-Sight Micro compresses an entire self-contained vision system into an amazingly small package about the size of a traditional image-capture-only camera. All In-Sight Micro models can be mounted at angles of up to 45-degrees using the In-Sight non-linear calibration tool. These vision systems are ideal for integrating into tight spaces on robots and hard-to-reach machinery anywhere on the production line. PatMax RedLine™ was designed with one goal in mind: blazing fast pattern matching on all In-Sight 8000 series vision systems. In typical applications, PatMax RedLine runs 4 to 7 times faster than PatMax – or faster! – with no loss of search accuracy or robustness. Together with PatMax RedLine, the In-Sight 8000 series can reduce cycle times and increase throughput without compromising inspection accuracy. Every In-Sight Micro vision system model delivers best-in-class performance. 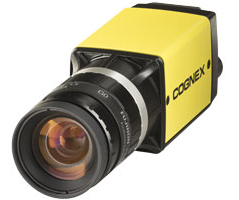 Most models are equipped with a full library of proven Cognex vision tools through the easy to use In-Sight Explorer software. These include Pattern Matching (PatMax Redline, PatMax, and PatFind), Filtering (Grayscale and Color), Color tools (Color ID, True Color Extraction, Color Histogram), Inspect Defects (Surface Flaw, Flex Flaw, Inspect Edge), and ID (1D/2D, OCR). Advanced Control Solutions is a Cognex In-Sight Micro distributor in Georgia, Tennessee, Alabama and Mississippi. We offer free evaluations and technical support to help our customers solve their applications.